Pinterest. Some days I love it (inspirational, beautiful, breath-taking pictures! ), some days, well … it’s like a good book – once you start, very hard to stop. But some good has definitely come from my Pinterest-ing: this recipe for Lemon Ricotta Cheese Cookies di Chef Luca for example! Full disclosure: I am not a tech-savvy person. I never have been, and before I started this blog, I was perfectly content with not knowing anything about anything social media-related. I wasn’t on Facebook, I never spoke about twitting on Tweeter, and I didn’t even have any idea that sites like Pinterest, Instagram, Reddit, etc. existed at all! I don’t know – social media doesn’t come naturally to me. And so when I discovered Pinterest, it took me a long time to learn to use it to my advantage, and not get completely distracted and discouraged and overwhelmed by it. Pinterest calls itself “The visual bookmarking tool that helps you discover and save creative ideas”. For all the uninitiated people like me, what this basically means is that Pinterest lets you browse a bunch of content (mostly images, sometimes the articles associated with the images, too), and “pin” that content to your own individual “boards”. It’s generally used as a planning tool (for trips, weddings, parties, etc. ), or as a means to get inspired (for recipes, DIY projects, redecorating, etc.). What I do is this… I try to keep my personal tastes and values at the forefront of my mind while browsing (e.g., I’m a dietitian, so even if something looks super awesome in the picture, if it’s deep-fried and uses 2 cups of butter, I try to give it a pass)… I also keep lots of different boards, so that I can keep all the stuff I pin well-organized (e.g., I don’t have a “Dessert” board – I have a “Cookie” board, a “Biscotti” board, a “Cake”board, etc. )… and finally – when something truly catches my eye on Pinterest, I print the recipe out right off and try it as soon as possible – within the next few days, if I can! I’ve found that it’s just so easy to pin stuff endlessly and forget about it immediately. For myself, actually trying out the recipes I see while I am still excited about them is the easiest way to combat this. Anyway, that’s what I do to keep Pinterest productive for me, and not just a distraction. But now… onto the Lemon Ricotta Cheese Cookies di Chef Luca! And my excitement level: Amazingly, the recipe incorporated some flavors and ingredients that I cannot get enough of (ricotta cheese…. swoon). I should not have been surprised. This recipe for Lemon Ricotta Cheese Cookies comes from chef Luca Montersino, after all. Chef Luca creates and adopts most of his pastry recipes to have a healthy spin. These ricotta cookies, for instance, have no eggs, no butter, minimal sweetness. Perfect! I’ve always loved ricotta cookies… I have a niece who makes some wonderful ricotta cookies; they are always part of her Christmas cookie platter and are always one of the first cookies to disappear. (I do plan on sharing her recipe with all of you, hopefully up just in time for Christmas). So I of course couldn’t pass this recipe up when I happened upon it! These ricotta cookies are a little unique in that they need to be rolled out in an 8-inch strand, and twisted in on themselves. To make them extra tasty, you can even try making your own homemade ricotta cheese. You will notice that a simple glaze adorns the tops. The cookies are really not sweet at all, and so this little sweetness is truly appropriate for a breakfast cookie. If you like cookies & ricotta, you'll love this recipe for these Lemon Ricotta Cheese Cookies di Chef Luca. Would you believe no eggs, & no oil? Intrigued? Preheat the oven to 325℉. Position rack to middle. In a medium mixing bowl, sift together flour, sugar, baking powder and salt. Incorporate the ricotta, lemon juice and zest. Divide dough into 12 equal pieces (approximately 45g each). Roll out each piece in a 7-8 inch strand. Form into a twist by "folding" over the strand and then twisting it once. Brush tops of cookies with milk. Bake for 20-25 minutes or until bottoms are lightly browned. If using commercial brand ricotta, make sure to drain the liquid. 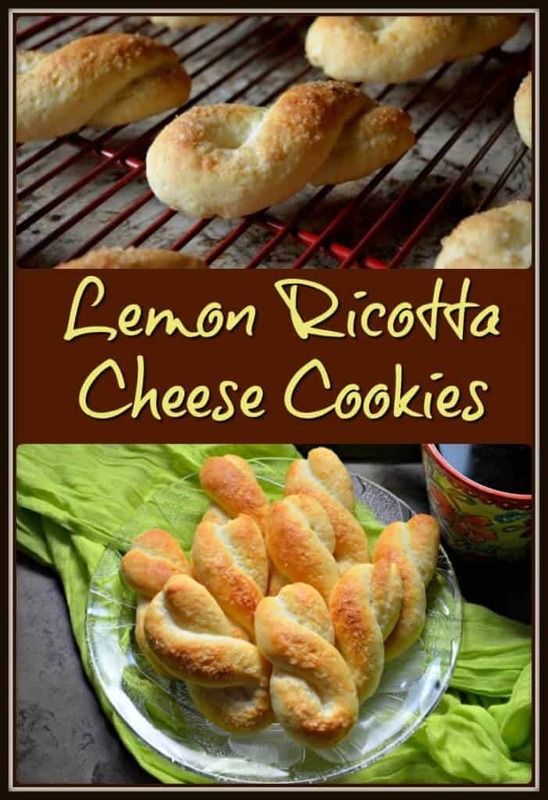 Made these tonight and they came out really good replaced the lemon juice with limoncello and also doubled the recipe. Thank you these are perfect for the Easter table. Nothing says Easter like ricotta and lemon combo. Thanks for the great easy recipe! Just baked a batch of these biscotti! Whilst they are delicious, is it correct they have a almost chewy outer and a moist center? Also is there any need to knead the dough lightly or roll each piece on a lightly floured board? I found the dough quite sticky and had to do so. Do you store them in an airtight container at room temp? How did you convert the grams to cups? I have so many recipes from Sicily that I can not convert. No matter what! Please help. Lemon and Ricotta are perfect together. This sounds like a really good cookie recipe. This looks utterly delicious. I love a great cookie and this fits the bill. I’m like you, when I first started blogging I had never read a blog, and I am not tech savvy at all. Years later I’ve gotten better, but some days are still a struggle. I love Pinterest though. It’s so much fun. I could pin all day long, every single day. I think the worst part of my blogging experience has really been learning how to use social media to my advantage. And I should know how to use it, I’ve been on facebook since 2006, but boy I didn’t know anything. And pinterest? Pinterest, I had no idea what to do with it until quite recently. So I’m glad I’m not the only one! I love this recipe and your photos are beautiful! Appreciate your honesty Krysten. The learning curve is different for everyone. I keep telling myself it is a work in progress 🙂 Thanks for dropping by. Ah yes, Pinterest is a double edged sword, but I’m glad you found these beauties in your scrolling. I like that they’re not overly sweet. These look incredible!! I love ricotta cookies and can’t wait to try your recipe! I love this idea! Ricotta is delicious and I like that they aren’t to sweet, delicious with a morning cuppa. Maria, thanks for sharing your lemon ricotta cheese cookies with us! The recipe is simple and easy to follow! It was my second experience baking and I think these cookies were a hit. Congratulations on your blog, it’s great and one of my favourite. Hi Ermanno! So happy you enjoyed them 🙂 Thank you so much …appreciate you taking the time to comment. I will need to forego this recipe because I do not have a food scale and not being a math genius I cannot determine how much 1-1/50th of a cup is. Or another calculation gave me 250 grams of ricotta is 1.087 of a cup. Sounds good and easy though. These look delicious. Will save this recipe. Hope you like it Jovina 🙂 Have a great day! Thanks for dropping by.